Lundi 27 juillet 2015 au soir, les Forces spéciales de l’administration pénitentiaire israélienne (Mitzada) ont fait irruption dans la prison de Nafha, située dans le désert du Néguev, en Palestine occupée. L’attaque fait suite à des actions menées par les prisonniers palestiniens pour protester contre leurs conditions de détention. Devant la résistance des prisonniers, les brigades Mitzada ont donc envahi les cellules, déplacé certains prisonniers et blessés une trentaine d’entre eux. Parmi les blessés se trouve Ahmad Saadat, secrétaire général du Front Populaire de Libération de la Palestine (FPLP), incarcéré depuis 2002 par l’Autorité Palestinienne puis, depuis 2006 par l’occupation. Des communiqués de soutien et des actions solidaires ont vu le jour, que ce soit dans les différents prisons de l’occupation ou en dehors. Plus de 6000 palestiniens et palestiniennes sont aujourd’hui enfermés par les forces israéliennes. Leurs combats pour leur libération est le combat pour la libération de la Palestine ! Libérez tous les prisonniers palestiniens ! Palestine vivra, Palestine vaincra ! On the evening of Monday, July 27, 2015, the Special Forces of the Israeli Prison Service (Mitzada) raided Nafha prison, located in the Negev desert in occupied Palestine. The attack follows the protest actions of Palestinian prisoners against their detention conditions. Faced with the resistance of prisoners, Mitzada special forces attacked and invaded the cells, transferred prisoners and wounded approximately thirty. Among the wounded is Ahmad Sa’adat, General Secretary of the Popular Front for the Liberation of Palestine (PFLP), imprisoned since 2002 by the Palestinian Authority and since 2006 by the occupation. Solidarity statements and actions of support are taking place, both inside the prisons of the occupation and outside. More than 6,000 Palestinians are now imprisoned by Israeli forces. Their struggle for liberation os the struggle for the liberation of Palestine! Palestine lives, Palestine will be victorious! Den fængslede PFLP-leder, Ahmad Sa’adat, og 30 af hans medfanger i det israelske Nafha fængsel blev om morgenen den 28. juli angrebet af fangevogterne der gik ind i cellerne, sårede fangerne og pågreb og konfiskerede deres personlige ting. Angrebet, der skulle straffe fangerne for deres udholdenhed og kampvilje, blev mødt med militant modstand fra Ahmad Sa’adat og de andre fanger. Internationalt Forums Mellemøstgruppe protesterer over overgrebene på Ahmed Sa’adat og de andre fanger i Nafha fængslet. Vi kræver løsladelse af alle palæstinensiske fanger i de israelske besættelsesfængsler. Der er pt. 5.820 palæstinensiske politiske fanger i israelske fængsler, herunder studenterledere, græsrodsaktivister og medlemmer af det palæstinensiske parlament. Mere end 400 af dem er administrativt tilbageholdt, 500 er børn, og 16 er medlemmer af det palæstinensiske parlament. Mange af fangerne – som Ahmad Sa’adat fra PFLP – er fængslet fordi de tilhører en palæstinensisk organisation der af Israel betragtes som en terrororganisation. Vi, Internationalt Forums Mellemøstgruppe, betragter Israel som en terrorstat. Palæstinensere, der bekæmper besættelsen, betragter vi som frihedskæmpere. Ahmad Sa’adat, the imprisoned General Secretary of the Popular Front for the Liberation of Palestine, and 30 other prisoners in the Nafha prison were injured in the morning July 28 when they were attacked violently by prison guards who entered their cells and examined and confiscated their personnel belongings. The attacks, which should punish the prisoners for their steadfastness, were met with fierce resistance from the prisoners. 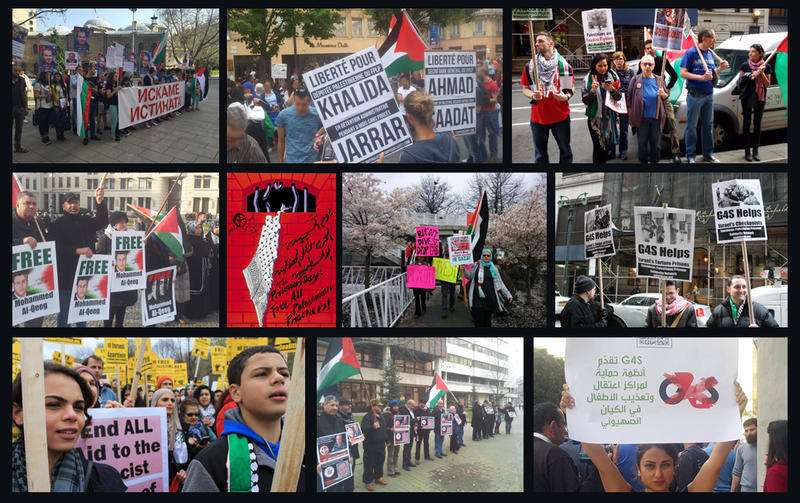 We, Internationalt Forum/The Middle East Group, protest against the violent attacks in the Nafha prison on Ahmad Sa’adat and the other prisoners. We demand the release of all Palestinian prisoners in the Israeli occupation prisons. There are 5,820 Palestinian political prisoners detained in Israeli jails, including student union leaders, grassroot activists and children. More than 400 are held on ‘administrative detention’, over 160 are children, and 16 are members of the Palestinian Legislative Council. , Many of them, like Ahmad Sa’adat, are imprisoned on the basis of their membership in Palestinian organizations that Israel considers ‘terrorist’. .
We in Internationalt Forum/the Middle East Group, consider Israel a terror state. The Palestinians who resists the occupation are freedom fighters. ΚΑΤΕΧΟΜΕΝΗ ΠΑΛΑΙΣΤΙΝΗ: Ενώ η Ελλάδα γίνεται η μοναδική χώρα στον κόσμο, πλην των ΗΠΑ, που συνάπτει “Status of Forces Agreement” με το ισραήλ (συμφωνία η οποία θα επιτρέπει τη στάθμευση ισραηλινών δυνάμεων σε ελληνικό έδαφος…), στις σιωνιστικές φυλακές οι ανθρωποφύλακες χτυπούν Παλαιστίνιους φυλακισμένους, περιλαμβανομένου του Αχμάντ Σααντάτ, ηγέτη του Λαϊκού Μετώπου για την Απελευθέρωση της Παλαιστίνης (PFLP). Παραμένουμε στο πλευρό της Παλαιστίνης και απορρίπτουμε την πολιτική της κυβέρνησης, που ντροπιάζει τον Ελληνικό Λαό και θέτει σε κίνδυνο τα συμφέροντα της Ελλάδας. OCCUPIED PALESTINE: While Greece becomes the only country in the world (apart the USA) who signs a “Status of Forces Agreement” with israel, in the zionist prisons the guards attack Palestinian prisoners, including Ahmad Sa’adat, Palestinian political leader and General Secretary of the Popular Front for the Liberation of Palestine. We remain on the side of Palestine and reject the government’s policy, which brings shame to the Greek People and endangers the interests of Greece.